Trinity Designs: Oh, Baby - it's a Card! Recently, I was asked to be one of four Featured Artist Stampers for my upline's demonstrator website. What an honor and priviledge to be asked - it sure puts me in the company of some great stampers who are an inspiration to me! Anyway, my upline is allowing me to share my work with my clients and downline via this blog. Over the next few weeks, I'll posting some of the samples here for you to see. This baby card was really very easy to put together - the key is that I mounted the 1 1/4" squares onto Very Vanilla cardstock which was then mounted onto the 5 1/4" x 5 1/4" card base. This allowed me to trim any uneven edges from piecing the "quilt". 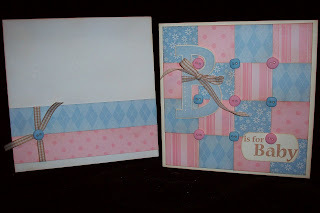 I used one of my new favorite stamp sets from the Spring Idea Book - "Just B" and the Pretty in Pink and Bashful Blue prints paper from the Level 1 hostess pack. All the edges were sponged in Creamy Caramel for an antiqued look and I attached the Soft Subtles buttons with mini glue dots. The letter "B" is cut out and mounted up on dimensionals. I finished it off with some Caramel Gingham ribbon. The Key Tag punch finished up the sentiment and I added the button and caramel sponging as well. The envelope is a Medium Square which is 5 1/2" x 5 1/2". I just added some of the paper, ribbon and a button for accents and sponged it as well. Not too practical for the US Mail, but would look great on a special baby gift! This card is one of my favorites from all that I created for my upline and I'm so glad I was able to share it with you. Leave me a comment if you like it! I'd love to hear from you. Very pretty!! I love how you included both pink and blue, which would be great for an expecting mother that does not know the gender of the baby!